Police have been instructed to carry out a new investigation into the unsolved murder of an Asian man in North Lanarkshire 13 years ago. 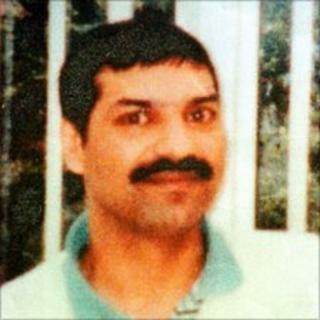 Surjit Singh Chhokar was killed in Overtown on 4 November 1998. Prosecutors failed to secure a conviction, despite the arrests of three men and two subsequent trials. The Crown Office has told Strathclyde Police to carry out a new investigation into the murder under double jeopardy legislation introduced last year. Mr Chhokar's family were informed about the decision by Lord Advocate Frank Mulholland QC and the Solicitor General for Scotland, Lesley Thomson QC, at a meeting in Edinburgh on Thursday. Speaking afterwards, the family's solicitor Aamer Anwar said there were still "significant hurdles to cross". "Thirteen years ago as Surjit's family began their struggle for justice, every step required their sacrifice and suffering," he said. "Surjit was described as Scotland's Stephen Lawrence, so when two of Stephen's killers finally faced justice because of the double jeopardy law, the Chhokar family dared to hope that that justice was still possible for Surjit. "The Lord Advocate and Solicitor General have taken important steps today, but there are significant hurdles to cross. The family believe there is a determination to fight for justice." He added: "Today is a second chance for the Crown Office to do the right thing but also to show there has been a positive change 13 years later. "Surjit's family will only ever be at peace when there is justice. It is now up to the Lord Advocate and Strathclyde Police to do all that is possible." Two inquiries were ordered in the aftermath of failed prosecutions over the Indian waiter's murder. One made allegations of "institutional racism". Following the publication of the reports in 2001, the then Lord Advocate, Colin Boyd QC, said that the Chhokar family had been failed by the police and prosecution services. Solicitor General Lesley Thomson said: "The prosecution service is committed to make use of the powers under the new double jeopardy legislation. "The Scottish Parliament, in passing the Act, has clearly stated that the passage of time since an acquittal should be no protection for those for whom there is new and compelling evidence of guilt. "We hope that our commitment to the new legislation will give reassurance to victims and their families." Humza Yousaf, the SNP MSP for Glasgow, said news of a fresh investigation into Mr Chhokar's murder was "a big step in the fight for justice" for his family. "For 13 years the Chhokar family has been searching for answers and every time they have left disappointed and despondent," he said. "By opening up an investigation into the murder I am hopeful that justice for Surjit Singh Chhokar and his family is closer than it has ever been before." The MSP said he had no doubt police would "work tirelessly on the investigation" but he also urged "members of the public to do their bit in aid of the investigation". He added: "If you have any information you think may be useful, regardless of how insignificant it may seem, please do contact Strathclyde Police who can deal with people on a confidential basis."